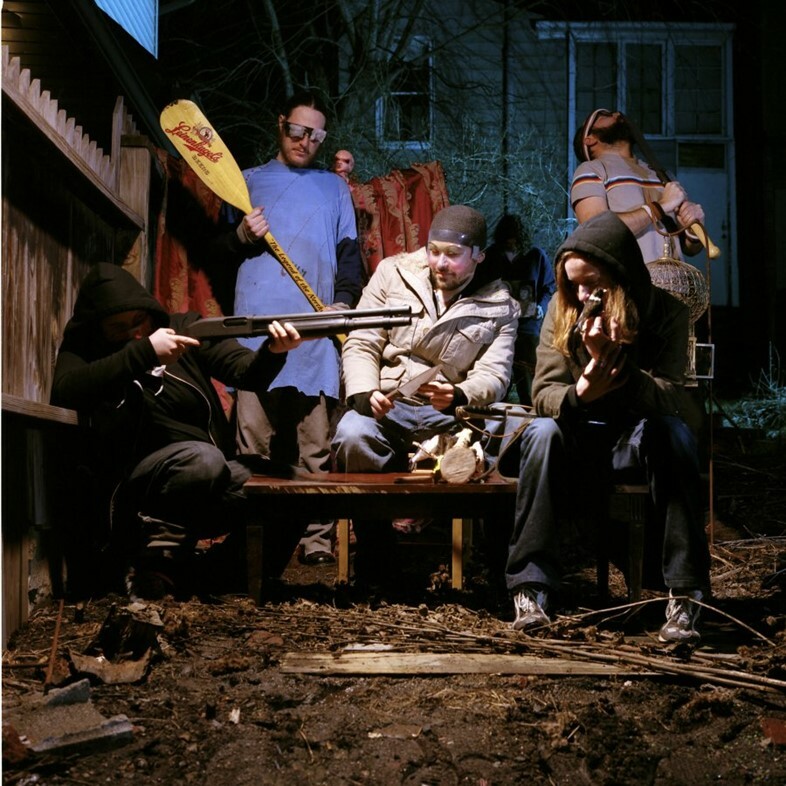 The mystical musical group known as Black Moth Super Rainbow emerged from a Pennsylvania forest glen as a creative outlay to remove themselves from day to day life in Pittsburgh. The dreamy, psychedelic rock group is made up of various oddballs (band members monikers include The Seven Fields of Aphelion, Power Pill Fist, D.Kyler and Father Hummingbird, no really) led by the elusive, masked frontman Tobacco. BWSR’s singer always hides behind his pseudonym, he even interviews with voice manipulation machines… So Dazed Digital tracked him down on email. Imagine an interstellar concoction of the Beta Band and Flaming Lips (Wayne Coyne even named a song after them “I Was Zapped By The Lucky Super Rainbow”) with a tripped out, backing orchestra of suns and moons. In a freaky folk double bill, not only is there the upcoming box of treats that is Black Moth Super Rainbow’s “Eating Us” album, but watch out for Tobacco’s heavy solo debut, the dirt box beats of “Fucked Up Friends”. Catch Black Moth Super Rainbow live in Europe for the first time later this year. Dazed Digital: We’re assuming you have Fucked Up Friends… don’t we all? Tobacco: Haha, not necessarily. My friends are probably pretty normal. Tobacco: Lots of thinking about it and realizing I’m overanalyzing. As long as it’s what I want to hear at the time, I’m pretty happy with it. DD: Which other artists inspire you? Tobacco: Longmont Potion Castle. He’s this prank call guy from Colorado that’s got the perfect technique and feeling in his recordings. He is to prank calls what I want to do with music. It’s all fuzzy and doesn’t make much sense at first, but when it’s over, you can’t imagine being without it. DD: The photos for the Tobacco album are pretty dark and twisted, who’s Beta Carnage? Tobacco: Those all came from the “Fucked Up Friend” DVD from a couple years ago. Beta Carnage is a guy who I met when we played with BMSR in Rochester, NY. He gave me this DVDR that was what ended up becoming the footage for Fucked Up Friends, and then with the exception of the album cover, all the other art came from the video stills. He had actually found all those old beta tapes behind a video store, out for garbage. DD: There’s a haunting yet optimistic feel to both albums. Tobacco: It’s not really in there on purpose, but I think music feels right when there’s some kind of weird balance between light and dark. You’ve got to give both at the same time. With the Black Moth Super Rainbow stuff, I want to make what I would consider straight up pop. With the Tobacco stuff, it’s all urges, without considering anyone else. DD: What’s better “Pink Goo” or “Iron Lemonade”? Tobacco: You’ve got to decide for yourself, but I’d go with Iron Lemonade. Black Moth Super Rainbow “Eating Us” is out June 8th on Memphis Industries, Tobacco “Fucked Up Friends” is out July 10th on Anticon.